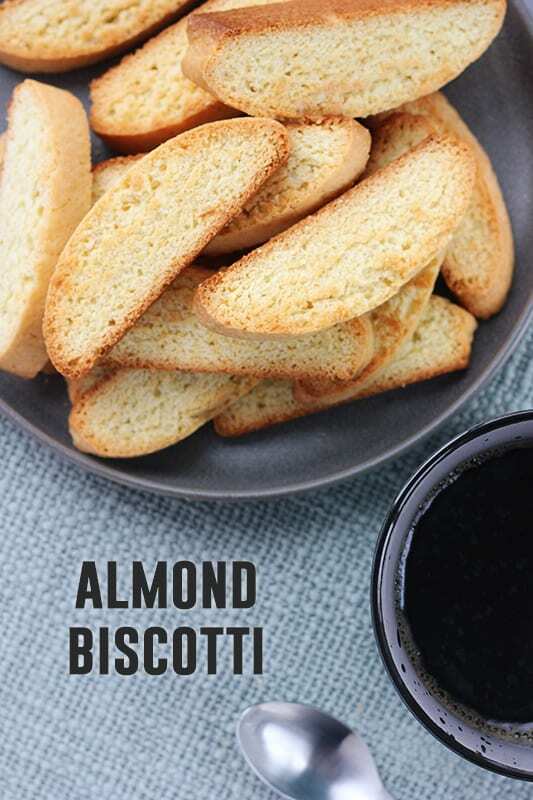 This easy Almond Boscotti recipe is the perfect addition to any cup of coffee. 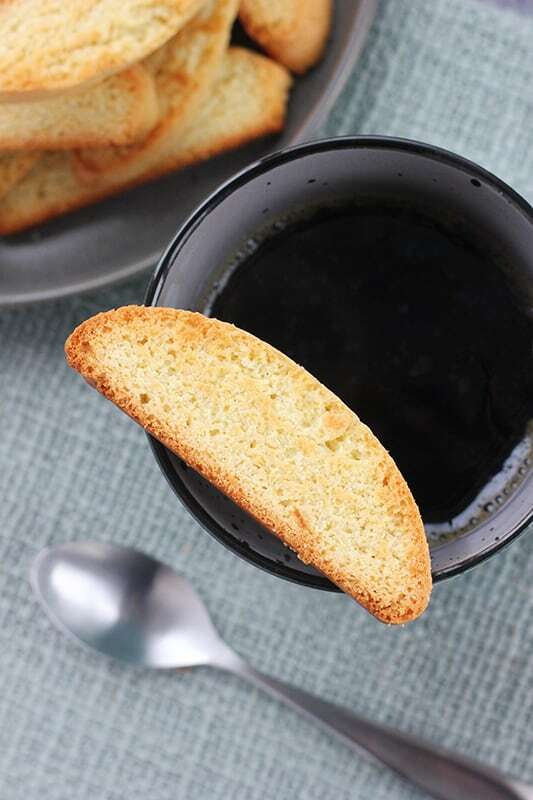 With only 8 simple ingredients you can have homemade biscotti in under 1 hour! Any Gilmore Girl fans out there? I can honestly say I wish I was living in Stars Hollow. There are so many great things about the show. The fast paced dialog… the witty conversations… The COFFEE. My husband jokes that the line “Coffee, coffee coffee!” was written by me. I looooooove a good cup of Joe. What goes great with a cup of coffee? Biscotti. Especially this recipe. There are so many reasons to love this recipe. It is so beautiful and impressive, packages well for gifts, and can even be dipped in chocolate! All of the magic starts with the dough. Disclaimer: I consider this an intermediate recipe. It is not necessarily difficult but there are a few tips you should follow. This dough is sticky. That is OK. It is supposed to be. The key is to make sure you chill it for at least 30 minutes before forming your loaves. Wet your hands before forming your loaves. This will help keep the dough from sticking to your hands. Use a ruler. When you are ready to slice into the cookies you can use a ruler to keep the size uniform. It is a little more time consuming, but well worth the effort. The almond and vanilla combination is out of this world! 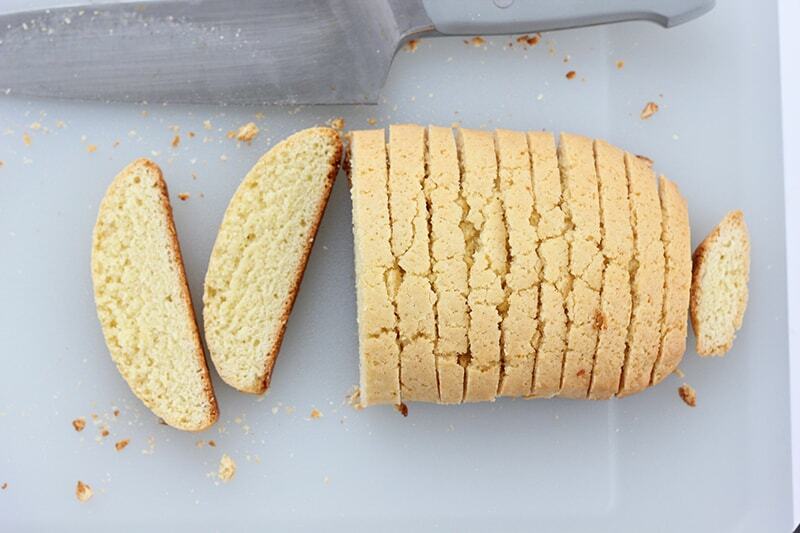 How do you cut biscotti? Great question. This is actually one of the FIRST things I am asked when I teach classes on how to make biscotti. I like to use a sharp knife. If you use a dull knife your loaf will crumble instead of giving you that beautiful cut. You can cut straight across or at a slight angle. I have seen it done both ways. Make sure you keep the sizes of each cut relatively close. Is biscotti supposed to be hard? Yes. It definitely is supposed to be crunchy. Baking the cookie twice gives it that crisp texture. That is what makes it ideal for dipping into cocoa or coffee. How do you store biscotti? How long does biscotti stay good for? Once you have cooked and cooled your biscotti, place it in an air tight container at room temperature. Your cookies should stay fresh for at least two weeks. It also freezes well. Store in a zip top bag and keep it in the freezer for up to three months. 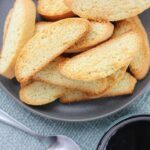 I love, love, loved this biscotti and you will too! Like this recipe? You will love my Gingerbread Biscotti, Candy Cane Biscotti, and Cake Mix Biscotti! 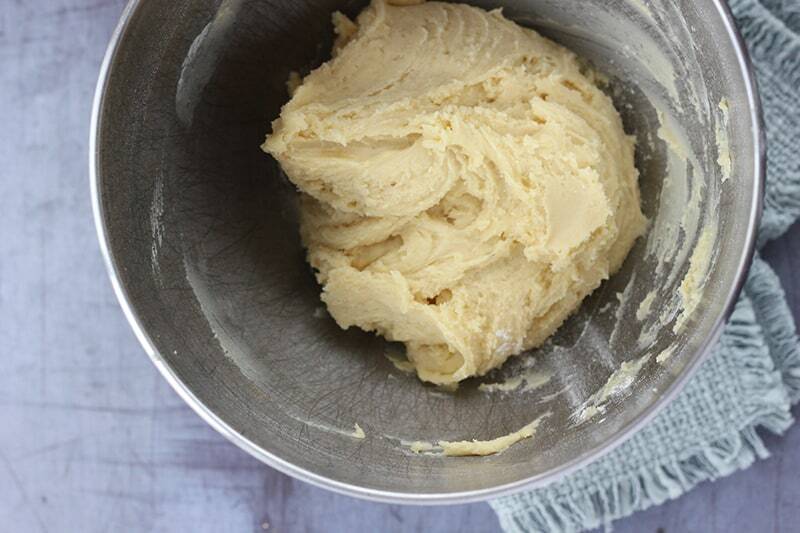 Combine the butter and sugar in the bowl of an electric mixer. Stir until combined. Add the eggs and extracts and continue to mix until incorporated. Add the dry ingredients to the wet ingredients. Mix on low until your dough forms. Cover dough and chill for 30 minutes. Preheat your oven to 350 degrees. Line a baking sheet with parchment paper and set aside. Cool for 15 minutes then slice into 3/4 inch pieces. Place, cut side down, back onto your cookie sheet and cook for 10 additional minutes. This dough is rather sticky. Run your hands under cool water when forming the loaves to help keep it from sticking to your hands. We are all smiles over here at Lágrima. So thrilled that you like the vanilla and the biscotti recipe. We read you blog post out loud – again all smiles. All the best to you! This sounds so good. I love biscotti with my hot chocolate. This will make a great gift for my mom too! Oh I love biscotti! I’m waiting until it’s a little bit colder out and I’m craving warm drinks. Then it’s on! 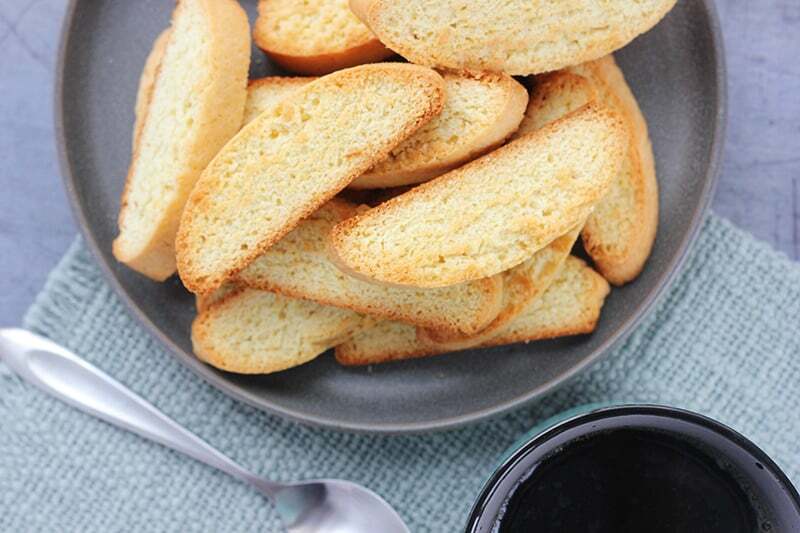 Yum, I love snacking on biscotti, but have never made it myself. This one looks so good, I can’t wait to give it a try! And I need to try that vanilla asap! Oooh biscotti? I’ve never made it before, but I think I need to try it. Looks so yummy! This biscotti recipe was the third one I tried and probably going to be the last as they are delish ! I add mini chocolate chips to mine ! Thanks for sharing ! Can’t wait to try this recipe! How many biscotti cookies does this make roughly? It depends how thick you slice them. I typically get 30-45 cookies. I just used this recipe for my wedding favors and they were a HUGE hit. I kept the dough as one piece to make huge full size biscottis and drizzled them with a lemon icing and everyone just loved them! All night guests were asking me where they could get the recipe (so expect a bit more traffic!). The best part was, I made them a MONTH before the wedding and they were still great! Talk about an easy, low stress favor than can be made in advanced! First of all, congratulations! And the lemon was a genius addition to the recipe! I’ll have to give it a try. Hi, wow it was good after a month! That’s great! Was it made and kept in the fridge or freezer? I would like to keep it on hand for my daughter instead of giving her store bought ones with preservatives. Thanks! I can’t wait to try them! hey Jessica!! Thanks a million … I tried making biscotti for the first time using your recipe n they turned out delicious… I didn’t have the almond extract so I only used the vanilla.. Thanks again keep posting the easy yummy recipes . I stumbled across these on Pinterest and decided to give them a go. I am so glad I did! They were easy to make and super delicious. Planning on serving them for Mother’s Day. Thanks for this delicious recipe! I make my own vanilla. It’s SUPER easy and is better than any I have ever bought. BTW the Biscotti recipe is WONDERFUL!! SO glad you liked it. I like making my own vanilla as well. This one uses premium vodka and vanilla beans and I love the taste but if you want to make your own it works just as well. I am making these for our clients, can I put slivered almonds on top or in? also do I only bake one side down and don’t need to turn them over? I’ll go in and adjust the recipe to make it a little easier to follow. I turn mine to keep the cooking even. Agreed! It’s still one of our favorites! I couldn’t agree more! Homemade is so much better! All I have to say is YUM. 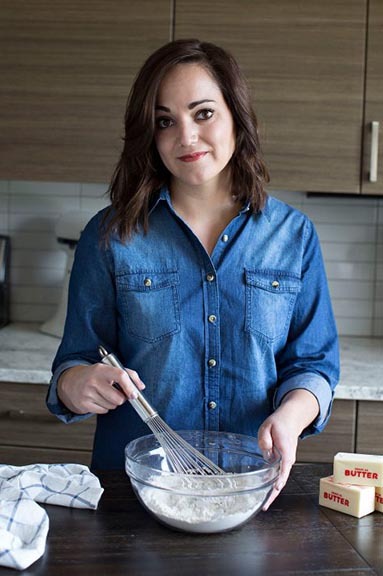 We have made this recipe dozens of times and I am finally leaving a review. It is simply amazing and so easy to customize. Last time we added finely shredded coconut and it was delicious.